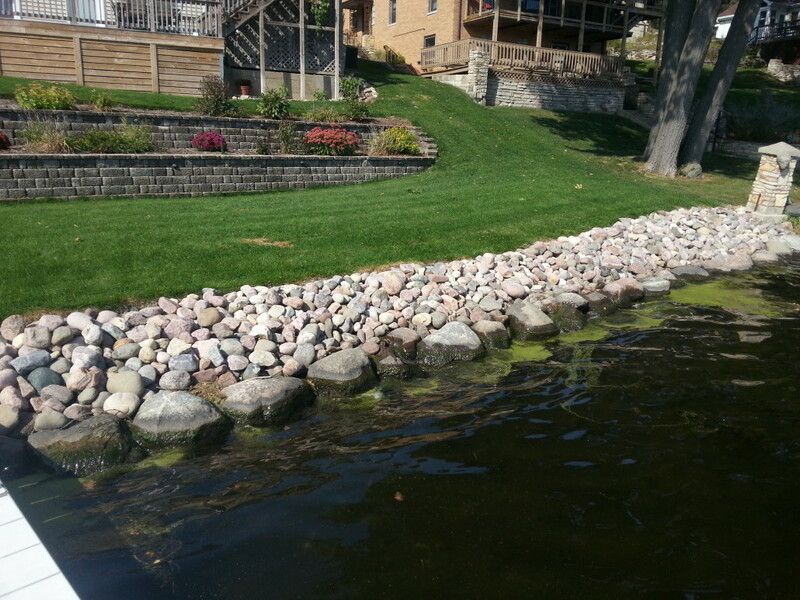 Why should you hire Koch Kuts for your Shoreline Landscaping Project? We are experienced and knowledgeable on your options and will provide the best care for your lake home or waterfront property landscaping. Proper shoreline landscaping techniques can benefit your property in a few ways. The addition of a retaining wall can add support to the earth surrounding and prevent flooding while adding a pathway can allow for beauty and usefulness. You can also consider adding a switchback or staircase from your home or building to the shoreline. Koch Kuts can install stone or other visually aesthetic means such as a small sand beach to prevent erosion. It’s also important to remove overgrowth that may be harmful to your shoreline such as buckthorn and other invasive growth. When landscaping your shoreline, it’s important to not disrupt the needed natural flora and fauna of your shoreline. When installing a boat ramp, patio, lighting, retaining wall, decorative plants or flowers – it’s important to make sure you don’t harm the natural habitat. A professional local landscaper like Koch Kuts will be knowledgeable and be sure to make this happen for you without any reason for concern. Koch Kuts specializes in top of the line shoreline landscaping. From the initial plans through to completion – we have you covered. Contact Koch Kuts for your Free Shoreline Landscaping Estimate.